In recent years, we have developed several approaches to overcome these application drawbacks of nanoparticles. For example, Fluoroalkyl silane (FAS)-loaded polystyrene microcapsules were prepared via Pickering emulsion polymerization using silica/titania nanoparticles as Pickering agents, wherein the nanoparticles were first modified with a Trixton X-100-tethered silane coupling agent. Under UV exposure, the microcapsules break up and release the encapsulated FAS, demonstrating its UV-responsive ability. The releasing rate of FAS could be tuned by the content of TiO2 nanoparticles in the microcapsules. Moreover, these microcapsules can be embedded into waterborne coatings and prolong the hydrophobic performance of the coatings especially those used outdoors, such as waterproof, anti-icing and anti-flashing coatings; We also used polymer latex and silica nanoparticles to fabricate structural color coatings. Through adjusting the diameters of polymer colloids, coatings or films with various colors can be fabricated. Some examples will be given to demonstrate the recent works in my group. Innovations are often driven by market needs and some of the market needs are a result of environmental problems. New water-borne organic/inorganic hybrid systems were developed because of a market demand for VOC free coating systems. Water-borne coatings have been available for a long time but water-borne organic/inorganic hybrid systems as binders for zinc dust paints are new. They combine the advantages of the organic and inorganic world and formulations offer new environmentally friendly possibilities for heavy corrosion protection formulations with excellent performance. Water-borne zinc dust paints based on these organic/inorganic hybrid systems can be over coated e.g. with solvent and water-borne epoxy coatings. Anionically stabilised waterborne binders are widely used. However, most of the substrates and most of the pigments used in waterborne paints carry a net negative charge. To adhere to such substrates or interact with such pigments, cationically stabilized binders rather than anionically stabilized ones would be a better choice. In this paper, we present an innovative waterborne cationic binder technology that offers unique advantages. The uniqueness of this binder technology lies in its non-permanent cationic character. The cationic charge provides universal adhesion properties. Upon drying of the coating the loss of the cationic charge release a basic moiety that locks acidic tannins that exude from wood proving excellent knot bleeding. This non-permanent cationic binder technology makes it possible to replace solventborne two-component binders with waterborne one-component binders. A permanent cationic binder technology has been developed. The presence of quaternary ammonium groups results in antimicrobial activity against gram+ and gram- bacteria. The uniqueness of this concept is the covalent incorporation of the quaternary ammonium groups. As result a non-leaching coating is obtained that exhibits a lasting antimicrobial effect that is maintained after repeated cleaning actions. Today's coatings technology is driven by a number of technical and commercial challenges. Additives being important ingredients in the formulation of coatings are used to valorize the related materials and advance the technology. Surface properties - such as leveling, slip, ease of cleaning, recoatability, hydrophobic or hydrophilic properties - are strongly influenced by the surface-active additives. These additives migrate toward the coating-air or coating-substrate interface and tailor the surface or interface properties. The performance and properties that these additives attribute to the coating depend on their chemical compositions and their structures. This presentation will show sophisticated additive technologies, with their highly structured polymer architectures derived from the macromonomer technology. It will present a unique concept of using hydrophilic additives to favor the wetting and leveling of the subsequent coating layer in multilayer coatings. We will illustrate the evolution of the current technology over the course of three generations of additives with examples of industrial applications. The first are surface additives such as standard polyacrylate that simply ameliorate the leveling and the last are sophisticated architectures (such as graft and highly branched polyacrylates) which – unlike other surface additives – can, not only increase the surface energy, but also additionally provide anti-crater properties to coatings. Dirt pickup resistance of masonry coatings is important due the impact it has on the aesthetics of the structure. Structures that resist dirt pickup longer periods of time retain their aesthetic appeal and require less-frequent repainting. Reducing the frequency of repainting can significantly lower the maintenance cost of the structure. As cities and urban areas have expanded, there has also been an increase in the amount of airborne dirt and particulate material1. These more challenging environmental conditions have forced the development of polymers with increased levels of dirt pickup resistance. As expected the increased din pickup resistance must be achieved without sacrificing other properties, such as low temperature flexibility and elongation. This paper will present the progress made to increase dirt pickup resistance of vertical elastomeric coatings while minimizing the impact on other properties of the coating. Polyvinylidene fluoride (PVDF) is well-known in coatings applications for its excellent weatherability, durability and chemical resistance. This paper focuses on the innovation of waterborne PVDF resins. The waterborne technology is proven to have similar weatherability and durability performance to the traditional solvent-based technology. It is produced by a fluorosurfactant-free process and can be used on metal substrates with a similar application condition as solvent-based coatings. Formulations with the waterborne PVDF resins can pass various standards, such as AAMA 2605. The waterborne technology is an eco-friendly solution to address the VOC content in coatings and to meet the current environmental regulation in China without sacrificing coating performance. In this paper, sulfonated graphene(SG) was modified by coupling agent, a series of waterborne polyurethane(WPU) coatings were prepared. The chemical structure of SG was characterized via Fourier-transform infrared (FT-IR) spectroscopy, X-Ray Diffraction (XRD) and scanning electron microscope (SEM). The performance of WPU film included water and organic solvent resistance, thermal stability, and mechanical properties as well as SEM imaging of the film surface were characterized in order to get the dispersion of SG. At last, the corrosion resistance of the coating was characterized by polarization curve and salt spray test. 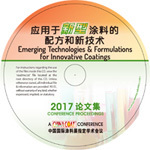 Trends in paint development and application are dominated and controlled by: legislation / need for solvent reduction, expanding perspectives for water-borne and powder coatings, high solids, UV curing and electrostatic application etc., demand for faster and cheaper drying/hardening, need for cost reduction, new and innovative materials, especially new binder agents, pigments and fillers, examples of new demands on surface structures and effects, clean surfaces, resistant surfaces, energy saving, nano technology: layers, structures and panicles, new substrates with new requirements. The referate shows the state of the art and the market situation regarding the solvent-reduced paint types, their particular properties, their advantages and limitations, the application areas, and the need of prospective drying and curing methods. The paper will focus on paint such as high solids, water-borne and powder coatings, while the development of applications and new products will be discussed. Further discussion will be on the recent development and change of radiation curing, e.g. UV LEDS and photonic NIR-curing. Smart self-healable coating is a hot topic in recent years. In this paper, a new kind of self-healable polyurethane will be discussed, in which the Diels-Alder (DA) structure is introduced to the main chain of UV curable polyurethane, in order to realize the controllable reversible crosslinking of the UV curable system. FTIR with increasing/decreasing/constant temperature, differential scanning calorimetry (DSC) and dynamic mechanical analysis (DMA) were conducted to study the thermal reversible mechanism of UV cured polyurethane coatings. The results indicate the thermal reversibility of DA structure is well-repeatable among the UV crosslinked networks. As a result, the highly cross-linked macromolecular network may decrosslink via rDA reaction under the action of heat and turn to a linear polymer with a certain modulus. The UV cured films show perfect self-healing properties and the scratch about 100 μm can be healed within 10 min being heated under 120℃. In the paper, dihydroxy monomer with azide groups was synthesized with the reaction of 2-2-double bromine(meth)-1,3-propanediol and sodium azide(NaN3). Using the dihydroxy monomer, polycaprolactone, isophorone diisocyanate, 1,4-butanediol, dimethylolpropionic acid as raw materials, waterborne polyurethane dispersion containing azide groups (WPU-N3) was prepared. A functional guandine monomer containing alkyne (TMG-Al) was synthesize with the reaction of 1,1,3,3-tetramethyl guanidine and 3-bromine propiolic. By triggering the click reaction of azide groups in WPU-N3 and alkyne groups in TMG-Al, a novel structural anti-bacterial waterborne polyurethane dispersion was prepared. The chemical structure of small molecular monomers was characterized by Fourier transform infrared spectroscope(FT-IR) and nuclear magnetic resonance spectrum(NMR). It was verified the bacterial contact-killing effects and non-penetration activity through the bacteriostatic ring experiment test. The results showed that the antibacterial effect for gram negative bacterial (E.coli) and gram positive bacterial (S.aureus) was significant, the antibacterial rate for both bacterial reached above 99.9% as the amount of TMG-Al in WPU about 5wt%.